Meet Anne Ridder, Interim Associate Dean & Director of the Graduate Liberal Studies Degree Program at the School of Continuing Studies and facilitator of the Bereavement Support Group. Simply a “circle of care” open to those in the University community who are experiencing grief from the recent or not so recent loss of a family member, close friend or associate, the group meets every Thursday at 1 PM in the Jewish Center’s Makom Gathering Space inside the Leavey Center. Sponsored by Campus Ministry since the mid-80’s, the Bereavement Support Group continues to help participants from all parts of the community find comfort and support and at times lift spirits in the short time spent together each week. We chatted with Anne about how she came to the group and how grieving fits in with our well-being. Particularly during and after holiday seasons memories “wash” over us, and the comfort of others often proves helpful. New Year’s hopes and resolutions for dealing with sadness and change will no doubt be central to the group’s winter weekly discussions. If you would like more information or plan to attend, please contact Anne at 202-687-5706 or riddera@georgetown.edu. GUWellness: Tell us about yourself. How did you come to Georgetown? Anne Ridder: My husband, Wendy’s Navy assignment, brought my family and me to the DC area in 1979, and I took a position as Director of Religious Education at Good Shepherd Catholic Church in Alexandria, VA. To facilitate and strengthen my work with the growing parish, I “found” Georgetown and pursued and earned the Master of Arts in Liberal Studies degree in ’82 culminating in my thesis, “Pastoral Planning within the Context of a Changing Church.” Georgetown beckoned again and in late ’83, I returned to volunteer status for the parish and accepted a fulltime position at a larger “parish,” Georgetown, first with the newly selected Registrar, John Pierce, next with Dr. Serafina Hager and undergraduate SLL students, and with much delight in ’89 succeeded Jean Esswein upon her retirement. I became Associate Director, Assistant Dean for Liberal Studies working with Dr. Phyllis O’Callaghan in the then School of Summer and Continuing Studies – back where it began for me as a student in 1980. Over this time our three daughters grew up, our five grandchildren are finishing high school and college, and all of us are “part Hoya” even with our previous KU “Jayhawk” degrees and other college affiliations. One Navy assignment after another kept us in the DC area, so Alexandria and Georgetown became our home. I discovered that Georgetown offers much more than jobs and degrees. It provides opportunities for community building formally and informally in service and in learning inside and outside its gates and classrooms.Yates mates, campus ministry friends, work colleagues, writing circle members, one time events, lectures, short courses, alumni activities, and, of course, the weekly Bereavement Group gatherings spark my Georgetown days. GU: How did the Support Group started? 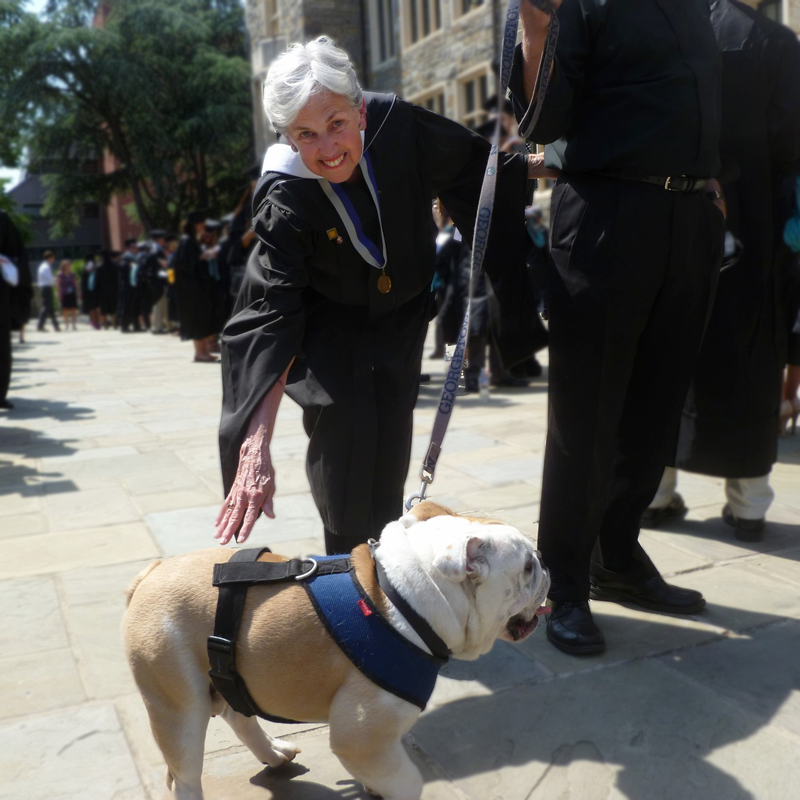 AR: One chance meeting in the Leavey parking garage with a Theology Department administrator introduced me to Georgetown’s fairly new Bereavement Support Group in January of 1991. “Happy New Year and Registration, Anne. How are you”? Jude asked. I answered hesitantly, “I’m fine. . . but not really.” I paused and then continued. “My mother died on Dec. 16th in Dallas after a 3 week bout of pancreatic cancer. But I’m back, I have to be, it’s a new term. . . .” Jude offered some kind words. I wrote her a note and took her some candy. About a week later, she brought me a short information sheet and told me about the weekly gathering of the Bereavement Support Group which she and a theology professor had started several years earlier with the sponsorship of Campus Ministry. Jude had been widowed, a young mother with 6 children, no one “talked” of such things in those days. She grieved silently, alone. Years later a professor confided in her all his concern for his dying mother in every available moment they could find to talk. He had found someone with whom he could share his fears and sadness. It dawned on them that they were surely not the only two people on campus shouldering the burden of grief. I listened to her story, with some initial reluctance decided to attend one of the weekly gatherings and “the rest is history.” A few years later, Jude retired, the professor had research abroad, and I was asked to facilitate the group in ’94. It has met weekly year-round ever since – different locales, some variation in its time from year to year, some members attending for years and years,some for a few sessions, some just enjoy a coffee visit with me from time to time rather than meeting with the group. Staff, faculty, grad and undergrad students, Senior Citizen auditors, and few neighbors attend, an ever changing group with subtle shifts in the group dynamics based on its current membership. About ten years ago an ambitious and grieving young sophomore, David Fajgenbaum, founded a bereavement group for students, AMF, the initials of his mother who died during his Freshman year. He has since introduced the idea to other universities. The group is nationally funded and been adopted on many campuses – that’s a whole other story. David battled and survived Castleton’s Disease and somehow complete medical school and practices in Pennsylvania with continued oversight of AMF nationally. AMF is again reinstated for undergraduates at Georgetown and headed by Jeffrey Lin, a junior, generously sharing his time with AMF, which now stands for Students Actively Moving Forward. Along with his own personal grief with the recent death of his mother to cancer, Jeff hosts weekly groups for student sharing and also coordinates their involvement in altruistic events that support medical research. The Bereavement Support Group and the AMF group have supported each other with ideas and activities over the years. GU: What is the connection between grieving and wellness? AR: Where two or three are gathered, good happens,sharing the joys of life or working through extreme sadness trying to understand or deal with the loss of life. A simple pamphlet placed around campus, the generosity of the Provost and HR’s Wellness Center to share information online about the Bereavement Group, the Jewish Center’s kindness to share its Makom Gathering Space each Thursday at 1 PM, chairs in a circle, a box of Kleenex, some Hershey kisses. . . friends and new attendees gather, and in this community Georgetown serves its own and beyond. It’s 2 PM and time to return to our offices, the library, or wherever. . . a hug, refreshed, and yes, some healing to wellness may have occurred. It was a safe place to cry and describe some tough feelings, just listen, maybe share some funny memories, or maybe learn of a better coping technique, maybe feel better, be in a new place. No time limit is set for “feeling better.” Experience with infant deaths, elder deaths, untimely deaths, suicide, deaths from known and unknown diseases. . . members relate how death came to those they grieve. Members are often very weary and recovering caregivers themselves. They need care now which the group recognizes. Grief has layers and its own timeline, but members do discover that life does go on, maybe differently. GU: What are some things that you do to Be Well? AR: The Group refreshes me year after year, sadnesses and grieving come and go among my family and friends. I treasure this community at Georgetown. Other ways I choose to “Be Well”? I enjoy early morning lap swimming at Yates on MWF, love to walk up P St. to Wisconsin and wander through the Opportunity Shop, and best of all I value my work for the University, the students, faculty, and alumni I serve who then through their academic experiences at Georgetown faithfully serve others. GUWellness is interviewing employees about the ways they integrate well-being into their daily lives in our Wellness @ Work series. Want to talk about what wellness means to you? Drop us a line or leave a note in the comments.